When the process is complete, the harvest is what you hold in your hands. Collect and disseminate what has been said, done, debated, decided, left undecided, or agreed upon as next steps. 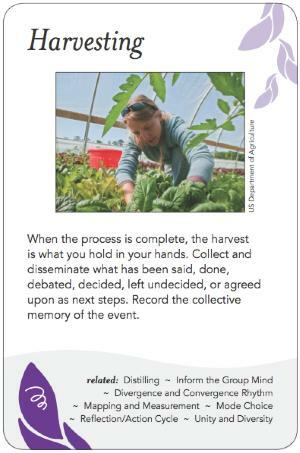 Record the collective memory of the event. At its simplest level, the harvest may simply consist of the minutes from a meeting. However, no one holds a meeting in order to generate minutes; rather, there is some other need to be met, such as a decision, an action, a release of tension, or a fulfillment of obligations to the state. So the harvest is a concrete result that helps fulfill that purpose. Harvesting needs to be considered well before a process actually takes place. The first step is to get clear on the purpose of the harvest, who will be using it and how. Will it be used mainly by people who were present at the event or is it to share the story with a wider circle? Is the goal of the harvest to establish an official record of what took place? Guide future action? Inspire others to get more involved? Or all of the above? Once you get clear on the goal, then you can work on what form it might take. What kind of records, templates, etc. will help you hold the relevant information or knowledge? There are many possibilities (see below). Once you select whatever your method is, make sure you have all the materials on hand to carry it out effectively. In large groups especially, you need to think through the physical mechanics of sharing information, such as how many microphones you'll need (and people to run those microphones back and forth around the room as different participants speak), how you'll get hundreds of pieces of paper distributed and/or collected, and so on. For technology-based methods such as mind-mapping on a computer, make sure you have the computer system set up and working in advance. The mechanics are an easy place to lapse and cause unnecessary frustration. Time/Sequence: Harvesting often happens at more than one stage of a process. For example, upon first engaging with a group, an outside consultant interviews some of the key people involved in order to find out what the group needs; the information from those interviews is one harvest. Later when a major group process happens, there will be another harvest. Who has access/transparency: Harvests are sometimes shared with the full group and other times held by a consultant or leadership group confidentially. Both in subgroups and in the full group (see Subgroup and Whole Group), harvests may be held with more or less Transparency. For example, if some protection of anonymity is needed, a group meeting might use a format called a Shelter Scale where a question is asked such as, "How much do you support this proposal?" on a scale of 1-7. Small blank sticky notes are passed out and each person writes a rating number. The sticky notes are collected and immediately collated into a bar graph in front of the group, thus providing a quick visual snapshot of the level of support for the proposal. That information may be useful both in the moment of the meeting in determining next steps (such as whether to amend the proposal) and for informing people who weren't present what happened. Consider whether your purpose would be better served by a harvest that is subjective (e.g., stories of what happened) or objective (e.g. transcripts or recordings), and whether pictures are important to evoke and recall feelings or the sense of the room. Where is the wisdom that was lost in information? Make sure your harvest goes to the core, so that people won't get lost in a sea of data. If you are using real-time scribing onto flipcharts or an online mind-map, try to avoid getting caught in debates over what the scribe has recorded vs. what the attendees believe was said. The easiest way to do this is to use more of the participants' own words and fewer substitutions. If summaries are needed, strive to be as neutral as possible in reframing them. The Ernst & Young Center for Business Innovation, in their Accelerated Solution Environment, employed knowledge harvesting to prepare the group for a problem-solving session. Experts in knowledge management did both primary (interview) and secondary (online) research to capture and document ideas and information of participants and outsiders in advance, and presented these to the group as pre-reading. In addition, when a group process was bogged down due to lack of information, these KM experts were deployed as couriers to seek and bring back the needed information. Show Me the Change: Complexity and the Art of Evaluation. May 2010 conference on evaluating behaviour change in sustainability programs in Victoria, Australia. Fantastic harvest by Geoff Brown uses video, cartoons, and text to tell the story of this 3-day event. Dancause Philippe posted the following to the Art of Hosting list: "We have been using [ word clouds ] to help put the mind of the group 'at the center.' One way we have experimented with it is to ask a group, just before a break, to write on a sticky note 'what is the word that resonates most in their mind at the moment' and stick it to the wall. During the break, we type in the words and, when people get back in the room, they have a wordle on the screen. The effect on the group is striking." See pictures of this and other methods in this set of photographs from the UNESCO Forum on Mobilization of the World Biosphere Reserve in Manicouagan Uapishka (Quebec, Canada in June 2009). Harvesting is more than just taking notes. To get a sense of the complexity of this art, let's begin by picturing a field in which someone has planted wheat. How can that field of wheat be harvested? We first imagine the harvest from that field as a farmer using equipment to cut down the wheat, thresh it, and separate the seeds from the stalks. The farmer might store the grain, further refine it, sell it quickly or wait for the price to increase. Now imagine a geologist, a biologist and a painter harvesting from the same field. The geologist picks through the rocks and soil gathering data about the land itself. The biologist might collect insects and worms, bits of plants and organic matter. The painter sees the patterns in the landscape and chooses a palette and a perspective for work of art. They all harvest differently from the field. The results of their work go to different places and are put to different uses. But they all have a few things in common; they have a purpose for being in the field and a set of questions about that purpose, they have a pre-determined place to use the results of the harvest, and they have specific tools to use in doing their work. Despite the field being the same, the tools and results are specific to the need, purpose and inquiry. In the expanded Art of Hosting way of looking at this, Harvesting becomes a driver in the entire design of the process. Peggy Holman wrote in pointing out, "I see harvesting happening throughout a session, at various points of time so the definition seems a little off to me."